On Friday afternoon, KMPO was made aware of new automobile emission control legislation that is sitting on the governor's desk awaiting his signature. The bill is HB586, and would require Kootenai County to establish an automobile emission inspection and maintenance program. After reviewing the legislation and weighing the potential impacts KMPO responded to the Governor's office with many concerns. First of all, Kootenai County is not in danger of violating any air quality standards in the immediate future. In fact, this new legislation is designed to prevent a metropolitan area from falling into non-attainment of the Clean Air Act. It is our understanding that the bill was written primarily to prevent Ada County from falling into non-attainment. Whether it was intentional or non-intentional, the threshold for creating a regulatory inspection and maintenance program was established for counties that are at or above 85% of the ozone standard established recently by EPA. Kootenai County is currently around 89% of the federal standard. Having researched the issue, KMPO is certain that our county could significantly reduce ozone emissions through voluntary programs that address the evaporative sources of ozone building compounds. This can be done much cheaper than establishing a regulatory inspection and maintenance program, and we wouldn't have to begin revoking car registrations at a significant cost to the county. You can read the letter we sent to the governor here. If you are interested in contacting the Governors office you can call his local office at 292-2521, or his Boise office at 208-334-2100. You'd think that after all of the car vs. train deaths we experienced here in Idaho this past year that more people would pay attention to the warning signals at railroad crossings. Nope. That is not the case. A recent emphasis patrol conducted in Spokane nabbed dozens of offenders. Check out the Spokeman Review story and video here. I like the end of the video where the semi truck pulling two tankers of gasoline jams on it to beat the train. Apparently, he could lose his commercial drivers license for that misjudgement. The Idaho-Press tribune had a great editorial on Sunday. The paper's editorial board implores the Legislature to set aside their agendas and start hammering out a real and substantial transportation funding package that can be easily passed during the beginning of next year's legislative session. You can read the full editorial here. This isn't really transportation related but I wanted to let all you Idaho residents know that things are going to be getting a lot more crowded, as Steve Jobs and Apple Computers have seceded from the union to start their own nation of iDAHO. It's the sleekest, slimmest, most stable nation in the world you know. Idaho transportation officials have a mystery on their hands. Every fourth or fifth telephone call to the state's travel information service, 511, is somehow getting rerouted to a similar traffic and transportation hotline operated more than 2,600 miles away in Rhode Island. "We apologize for the inconvenience," said Jeff Stratten, a public information officer for the Idaho Transportation Department. "While many highways in idaho are still snow covered, I understand the highways in Rhode Island are clear." Stratten advises that if you call and are connected with Rhode Island's service, hang up and call again. "It's a telecommunications mystery at this point," he said. Phone service technicians from Qwest are trying to figure out what's causing the problem. It was first noticed Thursday and is expected to be fixed by the weekend. Idaho road conditions also are available at www.511.com. BOISE – Idaho Gov. Butch Otter on Thursday backed away from his major proposal to lawmakers this year, to raise millions through new fees or taxes to address a giant backlog in road maintenance statewide. Otter issued a statement saying, "Simply put, there is a shortage of vision and political will within the Legislature to do what needs to be done this year." Reaction was mixed among lawmakers, with some disappointed but others celebrating a chance to drop the issue and end their overlong session – with a May 27 primary election looming in which every legislative seat is up for a vote. Aggressive drivers will be targeted today in North Idaho starting with the morning commute and throughout the day, police said. Law enforcement agencies will focus on drivers who speed, tailgate and roll through stop signs, said Idaho State Police Lt. Chris Schenck. But the "tone of the emphasis may change depending on the weather." Police agencies from throughout the region are expected to participate, Schenck said. The targeted areas will include Interstate 90 from Stateline to the east side of Coeur d'Alene and U.S. Highway 95 from the Coeur d'Alene Casino to Silverwood Theme Park. Not only that but the police are also teamed up with the railroads this week to catch drivers who try to beat the trains through intersections rather than stopping to wait. Read that full story here. Idaho's Speaker of the House Lawerence Denney said late Thursday that the House transportation funding package would not be put to a vote until at least Monday. He went on to say that Governor Otter had a point in the fact that the package may not go far enough, and added that it's difficult to raise taxes at any level when the economy is slowing. Here is the story at Eye on Boise. Do you think the legislature will have the political will to vote on the proposed $68.5 million package this year, or will they table this issue until after this election cycle? While Governor Butch Otter's office was tentatively supportive of the House transportation package that would generate roughly $70 million for transportation annually, that support could now be fading. Eye on Boise reported earlier today on the legislature's successful veto over-ride on drug treatment funding. Some are now speculating that the over ride move apparently didn't set well with the governor. They believe the governor may have vetoed a bill that would have provided the legislators with new laptop computers for the next legislative session. It looks like the 2008 Idaho legislative session is drawing to a close, with the House finally introducing a couple of transportation bills that could raise nearly $70 million annually in new transportation revenue. While the bills fall short of covering an estimated $200 million annual shortfall in transportation funding, the governor has indicated that he would be supportive of the measure. His transportation liaison called the package "a good first step." But, he also said that the Legislature would probably have to return to this issue in the 2009 legislative session, to address the remaining $130 million shortfall. Read the Spokesman Review story here . Question: If the legislature successfully passes this $70 million increase in taxes and fees this year, do you think the legislature will have the political will to raise taxes and fees even higher next year? The gas station owner in this story has a pretty good thing going. But the tourist passing through this tiny California town don't seem to think so. At $5.40 per gallon, some are saying that his gas may be the highest priced gas in the nation -- and, get this, he occassionaly sells out. For now, we can take some solice in the fact that our prices are not even close. To keep track of the average price, check out the AAA fuel gage report. Ok, so Idaho Transportation Deparment crews patched this one up already, but in the future if you see ten cars lined up on the shoulder of the freeway with flat tires, you might want to consider the fact that there is probably a road hazard ahead. The Idaho Senate passed a bill authorizing the sale of $134 million in bonds, which will be used to improve highways in Southern Idaho. While most of the money authorized this year will be spent down south, lawmakers said that next year a significant amount of GARVEE bond dollars will be used to improve Highway 95 between Garwood and Sagle. Read the whole story here. The Coeur d'Alene Press story (above) indicates that GARVEE passage was not very controversial in the Senate, but that was not the case in the House of Representatives last week. Idaho Public Television focuses on the GARVEE debate in the House here on Idaho Reports. This is one of those issues that has merit no matter what side you come down on. On one hand, some lawmakers argue that our state should not risk going into debt to finance infrastructure. On the other hand, most lawmakers argue that bonding now to build these major projects saves taxpayers in the long run because it heads off the dramatically escallating cost of materials. For those North Idaho folks who oppose the GARVEE method of financing, does it help to know that next year the long awaited widening of Highway 95 will recieve the lion's share of GARVEE dollars? (I know that is obvious baiting, but hey, we're trying to generate comments here). As far as pop culture goes, this is a little behind the times. But the bloggers here at KMPO (at least this blogger) wanted you to know about a new device that makes our streets safer to drive on. Turns out Idaho residents have more time to use their studded tires than several law enforcement sources and an Idaho state transportation official originally reported last week. Last week’s Getting There listed April 15 as the date for Idaho drivers to remove their studded tires. The actual date, according to the Idaho Transportation Department’s Web site, is April 30. While acknowledging her mistake, ITD spokeswoman Barbara Babic pointed out that any Idaho drivers who commute into Washington still must follow the Evergreen State’s law, which requires studded tires to be removed by March 31. The Idaho Senate Transportation Committee voted unanimously Thursday to pass an appropriation of $550,000 to conduct an audit of the Idaho Transportation Department. It now goes to the full Senate for a approval. You can read some of the details of that vote here. While the full Senate deals with that issue, the chairman of the Senate Transportation Committee is waiting for proposed "revenue enhancement" bills to be sent over from the House of Representatives. They may not have to wait much longer because the House Ways and Means Committee unanimously allowed the Democratic caucus to introduce its package of transportation revenue proposals, which will raise revenues by $97 million annually. While no one is quite sure how these proposals will fare, it looks as though they will be thoroughly debated. “We put ‘em out there for conversation, and people seemed genuinely interested in talking about them,” House Minority Leader Wendy Jaquet, D-Ketchum, told Spokesman Review Reporter, Betsy Russell, from Eye on Boise. What do you think about the revenue proposals submitted by the Idaho Democrats? So when does this become a workforce mobility issue? This is an intersting piece on how small business contractors and others in Seattle are coping with the rising cost of fuel. They are actually turning down jobs. The question I have is: How long will it take for the general laborer in our region to start turning down work because it is too expensive to travel? Do you have any thoughts on that? Rep. John Dingell, D-Mich, has proposed legislation that would raise the national gas tax by 50 cents a gallon. The congressman says the substantial increase would deter people from driving as much as they do, which would reduce pollution. Still, some policy analysts say that even if Americans quit driving, the effects on the environment would be negligible. According to a report by Fox News, the automobile is the nation's biggest polluter; Americans use more gas than the next 20 countries combined. Some environmentalists and economists say pain at the pump may be bad for Americans, but good medicine for a sick planet. But others say it wouldn't change much. Even if Americans abandoned their cars, global emissions would fall by less than one percent. "A tax on gas is a way to reduce dependence on import oil, reduce traffic congestion and reduce carbon emissions," said Lester Brown, president of the Earth Policy Institute. The Earth Policy Institute proposes raising the gas tax 30 cents per gallon each year over a decade and offset with a reduction of income taxes, Brown said. According to the story, less than half of the respodents to a recent poll oppose any increase in the gas tax and almost 30 percent would pay an additional 50 cents. How much would it take to incentivize you to start using alternative forms of transportation? Here's my piggybank after getting gas today. The Idaho House of Representatives voted Tuesday to approve the sale of another $134 million in GARVEE bond funds to finance improvements on state highways in southern Idaho. That is with the understanding that next year a large sum of the funding raised by GARVEE bonds will be applied to Highway 95 from Garwood to Sagle. The passage didn't come without some controversial debate. It passed at 47-23. Opponents argued that the GARVEE bonding program should be suspended for one year until a previously funded audit of ITD is complete. On Monday the House unanimously passed legislation approving the estimated $550,000 ITD audit, which would include a look at the transportation agency's GARVEE contract manager procedures. Read the article and give us your opinion. After a little rain and a hard freeze, the bridges on I-90 and Highway 95 were sheets of ice during the commute hours this morning. I've lived in Idaho most of my life, and never have I seen an effort to slow traffic down like the one I saw this morning in Post Falls. Idaho State Patrol, Kootenai County deputies and local police were staged along the freeway between the Spokane Street exit in Post Falls and State Line. They were escorting traffic in both the eastbound and westbound lanes. They also lit road flares to alert unsuspecting drivers of the danger. Still, of course, there were those who were caught off guard. Many of them wound up in the ditch or worse. I saw that pickup pictured above that looked like it went over the Jersey barriers and rolled about 20 feet down the embankment just past the westbound I-90 onramp at Spokane Street. 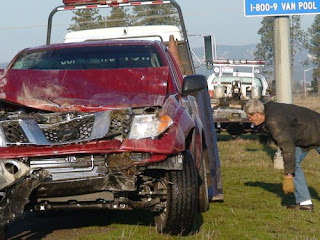 Here is a Spokesman Review video of a tow truck removing that vehicle. Apparently things were not much better up north near Cocolalla lake, where two people lost thier lives in a crash at Blacktail Road and Highway 95. Here is the Spokesman Review story. Did you see any weather related incidents this morning? According to Eye on Boise, the House has voted unanimously, 67-0, for a $550,000 performance evaluation of the Idaho Transportation Department. Rep. Marv Hagedorn, R-Meridian, said “another set of eyes” is needed on the department. Rep. Phil Hart, R-Athol, said ITD has had three directors in the past three years, and three board chairmen, and the state’s had three different governors and started GARVEE bonding. “There’ve been a lot of changes in the department,” Hart said. “We think it’s appropriate that we take a look at them through this performance audit, and make sure that if and when we give them more revenues that those moneys are being spent wisely.” resd the rest of the story here. How Aware Are You Behind the Wheel? Sometimes it's hard to drive, eat breakfast, apply makeup, and tune the radio at the same time, while still paying attention to your surroundings. Take this test to see how aware you are. Biodiesel Street Rods?? What's Next? They're fast, tough-looking and... fuel efficient? A North Idaho man is building the 'street rods of the future,' if there is such a thing. Read the story and tell us, if you were to buy a street rod, would you give one of these a try? Do you have any tunnel visions? This is an interesting story. 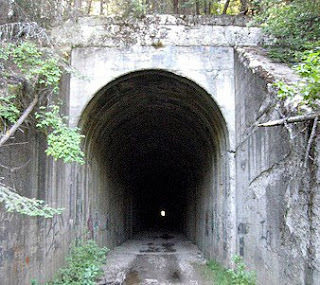 If you had the money to purchase this tunnel in Plummer, what would you do with it? It stays 50 degrees year-round, it's a half-mile long and it comes with 54 acres of commercially zoned property. The owners are marketing it to wineries and mushroom growers. Can you think of any other uses? According to Betsy Russell at the Spokesman Review's Eye on Boise Blog, the legislature was hoping to adjourn a week from today, but that deadline is likely to be extend to give them time to resolve transportation funding issues. Two bills are in play that would generate about $2.74 million in new revenue annually. Also in play is another bill, introduced by Rep. Phil Hart, Athol. His bill would divert about $22 million of existing revenue into transportation accounts. You can read about those here. What started as a proposal asking the legislature for the authority to impose a local option sales tax for transit in metro areas has turned into a constitutional amendment to grant local option taxing authority for any purpose. The kicker is that the local option tax must garner a super majority of votes, or 66.6% of the vote to pass, and the vote can only be held on general elections in November. The bill made it out of committee on a party-line vote, but some believe the strict restrictions on the voter approval process are "poison pills," meaning they are intentionally designed to generate enough oposition to kill the bill on a floor vote. Ever wonder what traffic is like before heading over into Spokane, or before you embark on your trek home? Now, you can check it out for yourself at the Spokane Regional Transportation Management Center's new interactive website . It is the SRTMC that controls all of those traffic cameras you see on the morning news, but that's not all they do. Check out the video above. The City of Spokane's City Cable 5 will air this piece in Spokane soon, but we thought we would post a preview for our loyal Idaho readers who do not get Spokane City Cable. SRTMC employees are also the people who get write the messages on those electronic reader boards along the interstate. I must admit I've always wanted to write something on those boards. If you had control of the cameras and the boards you could really mess with people. Could you imagine passing one of those signs and reading: "Hey you...Yes you, in the white covertable. Put down the pink razor phone, flip up the makeup mirror and drive!" What would you write on the boards? Seems like it's not often anymore that the government actually gets thanked by a citizen. 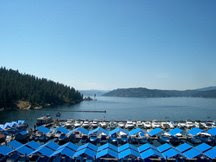 Well,here's one person who thinks Coeur d'Alene did a great job during the tough winter and wants to let them know. Others say that snow plows are an endangered species in Kootenai County though. What's your opinion? How high do gasoline prices have to go before we plan for alternative transportation that is affordable, sustainable, and supportive of the Growth Management Act? A majority of Spokane County residents are supportive of rail transit but the Spokane Transit Authority Board of Directors discontinued the work on light rail as "too proactive and ahead of its time". All we are asking is that PLANNING for light rail transit resume so the region is postured to implement a system whenever the time is right for implementation. Ironically, the former STA Light Rail Steering Committee calculated that the annual cost of delaying light rail is more than the annual cost of operating a light rail system. It is time to conduct preliminary engineering for a south valley route between Spokane and Liberty Lake. We should also start NOW on planning the route to connect Spokane's downtown business district with the Spokane International Airport. He's got a point. The national media was reporting yesterday that gasoline prices could rise any where between $3.75 to $4.00 per gallon this spring. What are your thoughts? The death toll has been a big one this year for North Idaho wildlife, which one sheriff's deputy is blaming on the salt used to deice the roads. Read the story here and let us know if you've had a run in with any animals lately. I've been taking it just a little slower since seeing a coyote get pulverized by a semi last Sunday and following a moose as it weaved it's way back and forth across the road this morning, making me late for work. Of course it was the only day I didn't have my camera with me. The Joint Finance-Appropriations Committee voted 18-1 on Friday to move $134 million in GARVEE bonds one step closer to reality. While the bulk of that money is being earmarked for projects in southern Idaho, two of our local lawmakers were still supportive of the bill. Read why they are supporting it here. Is it better for our local delegation to lend support to to this in order to gain support for another $90 million for Highway 95 next year? The president of OPEC announced today that crude oil prices are likely to stay above $100 a barrel throughout 2008. Of course, he cited the weakening US currency and the "geopolitical" atmosphere as the root cause for the price hike. The price may start to correct itself in 2009, after the seating of a new US president and if the dollar starts to rebound, he added. Read the full story here . Oh, and by the way, crude oil topped an all time high today at $107 per barrel. 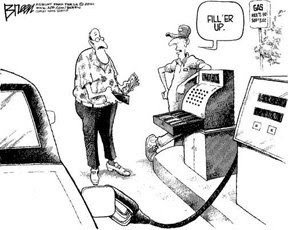 Are you feeling the pain at the pump? I've seen some pretty dirty cars around lately, what with it being spring and all. This new 'North Idaho Car Wash' method may not work for everyone, but I'd be willing to give it a try if it meant I could see out my windshield. “I’m still willing to work with ‘em, but I’m no longer prepared to provide the political cover,” Otter declared. He noted, “It’s an election year – they’re standing for election, I’m not." What do you think the sausage grinder will spit out to help with transportation costs this year? We didn't realize this yesterday when we posted the thread on rising fuel prices below, but it appears that The InlandRail web site went live this morning, and man, it's an interesting read. Not only is this group focused on a new and improved light rail concept but their goals and objectives are much broader in scope. They are now emphasizing a regional system that reaches right into downtown Coeur d'Alene! Check out the goals here. As we mentioned in the post below, the skyrocketing price of fuel is reason enough to give light rail another look. And it looks like the InlandRail board of directors has done just that. They are now advocating for an electrified Light Rail Transit system rather than diesel powered, and the first leg would go from the Spokane County Fairgrounds west to the airport. 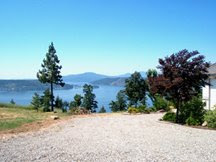 The second leg would go from Liberty Lake to downtown Coeur d'Alene. What about the middle link through Spokane Valley, you ask? Well, I'll just let InlandRail's "vision" page explain that one. Read what they have to say about the Valley and STA under the "Other Thoughts" heading. (I told you it was an interesting read). So, how do you think Kootenai County taxpayers will react to light rail system from downtown Cd'A to the Spokane International Airport? Would they be willing to pay for it? Drivers ticketed for speeding in school zones will face much steeper fines under a bill that just passed the Idaho Senate. Take a look at the new fine amounts and voice your opinion, are these fines too high? Do we need more personal mobility options? Bloomberg reported today that crude oil prices could climb as high as $120 per barrel within the next six months. In California gas prices have already topped the $4.00 per gallon mark. It looks like the politics of oil combined with the weakening dollar could spike the price even higher in the future. Read the story here. 1) In 2006 Spokane floated a ballot measure asking voters if they wanted to move a regional light rail system forward. The system would have been designed to accommodate a connection from downtown Coeur d'Alene to Liberty Lake, and then west through Spokane Valley to downtown Spokane and then on to the airport. While the measure failed (49% favored the option), plans for that project have not been tossed out. In fact, a new non-profit has been recently formed to resurrect the project. The group is called The Inland Empire Rail Transit Association, and you can read more about them here. There has been some talk in the North Idaho development community about light rail as well. Considering that light rail would take at least a decade to plan, design and build, it might be wise for our policy makers to get involved in this regional discussion. 2) More recently, there has been some discussion of connecting the Spokane Transit Authority's bus system in Spokane with the City Link bus system in Post Falls. While those talks are preliminary, there certainly is a need for a bus transit connection between Kootenai and Spokane counties to provide an alternative to Spokane workers who live in Idaho. (Heck, after commuting from Post Falls to Spokane everyday this past winter, I would definitely pay to ride it). Question: what do you think we should be doing locally to offset the impacts of rising fuel costs? Coeur d'Alene is taking a hard line with property owners with damaged sidewalks. Read the story and let us know if you think this is fair, or if you're one of the people who received a 'reminder' letter. It took a team of dedicated transportation professionals and millions of dollars, but we've finally come up with the holy grail of transportation issues: a solution to the problem of congestion. Watch the video, but if you get arrested, you didn't hear about it from us. This project could get nasty. The city of Post Falls is planning to widen and overlay Mullan Avenue between Highway 41 and Idaho Street. The $1.9 million project is expected to begin later this month and last through September. Aside form being the only access to Wal-Mart, this could adversely impact traffic on Highway 41 as well. Travelers are advised to plan a little extra time for their commute. Read the Coeur d'Alene Press story here. Will this impact your commute? The Spokane Regional Transportation Management Center (SRTMC) has a new website that can help save time, gas, and frustration for Idaho drivers who commute to Spokane. The new high-tech, customizable site provides real-time traffic information to help motorists avoid accidents, delays, and construction projects. The SRTMC is a collaboration of the Cities of Spokane and Spokane Valley, Spokane Transit Authority, Spokane County, Washington State Department of Transportation, and the Spokane Regional Transportation Council (SRTC). Check out the site, and your route, here.